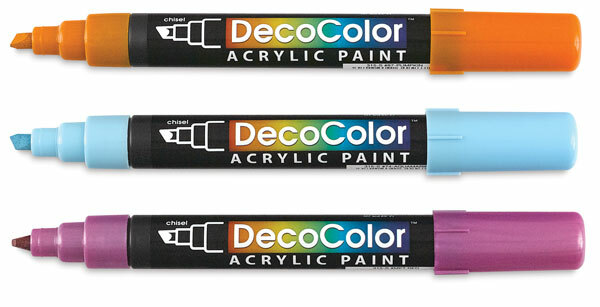 These pigmented water-based acrylic paint markers are ideal for all your crafting needs. Lightfast and permanent when dry, they clean up easily while wet. The chisel point allows fine lines and broad strokes. Bright Colors, Set of 4 — Includes one each of Aubergine, Violet, Pink, and Yellow. Primary Colors, Set of 4 — Includes one each of Black, Red, Blue, and Green. 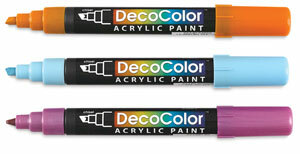 Metallic Colors, Set of 4 — Includes one each of Metallic Gold, Metallic Silver, Metallic Blue, and Metallic Green.